If you want to make sure that your family always arrives in luxurious style, then you need to take a look at the Mercedes-Benz GL-Class SUV at our Mercedes-Benz dealer serving Orange County. This full-size luxury SUV not only rules the road with a powerfully efficient engine, it does so with a magnificent cabin that keeps every passenger’s comfort in mind. From the front seats to the third row, there is plenty of space and plenty of amenities to ensure everyone enjoys the ride whether it’s a trip to soccer practice or your next big family excursion. Let’s take a look at what makes the interior design of this sports utility vehicle so special. If you’ve dreamed of a vehicle comfortable and spacious enough to virtually eliminate complaints from the kids in the back, our Mercedes-Benz dealer serving Orange County may finally have the answer. 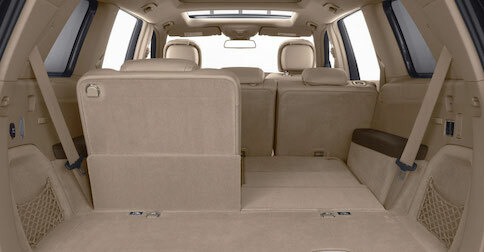 That’s because the large side doors and EASY-ENTRY® second-row seats make it easy to get in and fill the seats up. There is plenty of room for up to seven adults, so the kids shouldn’t have to worry about not having enough legroom. Not only will they have enough space, they’ll also have enough entertainment options to keep them quiet and happy. Available dual screens in the backs of the headrests allow rear passengers to watch separate DVDs through wireless headphones. Serenity on the road can be yours at last. The 2016 Mercedes-Benz GL-Class also delivers versatility and capability just like a true SUV should. When you’ve got some tasks to take care of on the weekend, the power-folding third row and 60/40 split-fold second row of seats offer up to 93.8 cubic feet of cargo space. Plus, the power liftgate makes it fast and simple to utilize all that space when your hands are full. It’s safe to say that this full-size premium SUV makes great use of all that space for the comfort of you and your passengers. Contact Walter's Mercedes-Benz of Riverside today to learn more about the new GL-Class SUV. For more information, give us a call at (888) 294-6772.